An online correspondent wrote (thanks, Remi! ), wondering how we're going to effectively cut methane by getting the world to go vegetarian when we can't even get people to go veg in order to stop world hunger. He raises a good point. 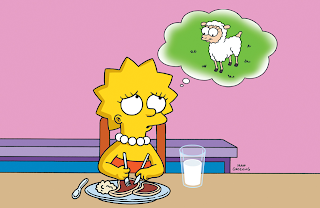 People who eat meat out of habit or superstition also don't tend to consider the impacts of their diet on the environment (pollution and resource depletion), on others in the world today (grain going to feed cattle and other livestock animals instead of to fellow humans), or on future generations (our Western meat-focused diet is a huge contributor of methane and other greenhouse gases). What if we presented the choice this way: Would you rather voluntarily cut back your meat consumption to virtually zero in the next year thereby giving the world a fighting chance of safeguarding your children's future, or continue eating meat, ensure a future of climate chaos and hunger for your grandchildren, and have your right to meat eating taken away from you by force in the not-too-distant future? There will come a time (probably not soon enough, sadly) when governments will suddenly start doing everything they can to mitigate global warming. Since livestock is such a huge contributor, it will one day be seen as an easy way to reduce our GHGs. In North America, we often cite the success of anti-smoking campaigns, but their "overnight" success took decades. We don't have decades to make this huge social change. Why not just look on it as a sacrifice we have to make for our children — one that is a lot better for us than going to war, and one that can actually be quite fun and delicious.